I was lucky enough to travel to Syria in 2008 and see the historical and religious sites before war and chaos destroyed the country. I shared a picture of mine from Syria on my Instagram and a lot of you requested more pictures so here goes! 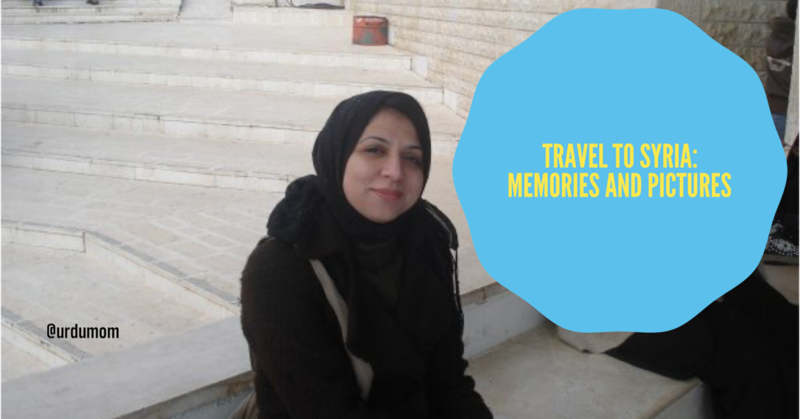 Here are some of my cherished memories and pictures from travel to Syria. I apologize that the pictures are not of the best quality because I took them ten years ago. The picture above is of the Roza of Hazrat Zainab that stands tall in Damascus. The centuries old Omayyad Moqsue is also in Damascus. The entrance of the Omayyad Mosque where the women and children of Ahle Bait were made to wait for three days by Yazeed. Inside the courtyard of the Ommayad Mosque. The Ommayad Mosque was a cathedral before, as you can see from this facade. What you see above is the throne of Yazeed. This is the tomb of Hazrat Yahya (A.S.) inside the mosque. Stone, Sand and Green: a beautiful piece of land, on our way to Halab, the city of Hazrat Ibrahim A.S, also named after one of his alqaab. This city is also called Aleppo and has been totally destroyed by war. Outside the church of the Christian Priest, who safeguarded the head of Imam Hussain for a night, as the procession made its way from Iraq to Syria. On our way to the grave of Hazrat Habeel A.S. The grave of Hazrat Habeel A.S. is right at the border of Syria with Lebanon. Steps leading down to the grave of Hazrat Habeel (A.S.), the first grave in the world. Resting on the old steps. The old market still maintains its character. This is Bab-e-Sagheer, one of the oldest graveyards in the world. Tracing our Jaffri roots at the graveyard. The steps leading to the cave of the Ashabe-Kaif (as claimed by Syrians). Inside the cave of the Ashabe-Kaif (as claimed by the Syrians). They say the companions still rest on the other side. I’m not sure about the authenticity of this, so please don’t issue any fatwas on me! Hope you enjoyed these memories and pictures of my travel to Syria. Hoping for peace in all the world including Syria. Next Post Eid Menu, Recipes and the Easiest Dessert in the World! Lovely pics! Inshallah I will be able to go there one day for Zyarats. Masha Allah, how lucky! I think my grandmother and other family members have been there earlier when I was small. I wish to go there for the ziarat one day too!